Many disruptive leaders not only radically change traditional ways of doing of business but are also committed to challenging generally accepted norms of leadership behavior and business propriety. They are among the most ambitious people in the world and are known to push ethical and legal boundaries in their unrelenting drive to get what they want. Many of them have learned how to modify their more extreme behaviors when necessary but a few have also gotten so ahead of themselves that their boards had no choice but to fire them. Travis Kalanick, the former CEO of Uber, is the quintessential high- profile example of a successful disruptive leader whose success and ego blinded him to the necessity of building a culture of accountability and ethics and adhere to local and state employment laws. The company was sued, investors left in droves and many municipalities threatened to cancel their licenses. The descriptions below give us a snapshot of how the world—or at least how the media—views the behavior of several of these leaders. Clearly, there is no standard set of behaviors disruptive leaders are expected to adhere to, and these few examples make clear how contradictory and complex these individuals can be: visionary, murderous, goofy, nerdy, technical, complex, solution-oriented, introverted, critical, intellectual, nonlinear, chaotic, restless, unbusiness like, laid-back, paranoid, perfectionist, and on and on. Given the chaos that a big and audacious disruption can leash, it is quite natural that those of us who feel we have a lot to lose from a disruptive event will fight hard against it, questioning the disruptive leader’s ethics or whether his or her ego is getting ahead of the game. Unfortunately, any large-scale disruption is going to produce winners and losers, and disruptive leaders are almost always lightning rods for controversy. Most disruptive leaders have no problem thinking outside the box, and many actively push the boundaries of what society considers to be ethically and legally correct at the time. But the course of history has shown that yesterday’s moral frameworks are swept aside by the next generation’s view of what is right and ethical. Large egos are not always welcome by society, and disruptive leaders need to have a healthy ego in the face of resistance. But truly great leaders understand the importance of keeping their egos from getting in the way of being open-minded and learning during the process of a big, audacious disruption. These leaders replace ego with confidence. 2 Krasny, Jill. “The Jeff Bezos Recipe for Disruption.” Inc.com, Inc., 15 Oct. 2013, www.inc.com/krasny/jeff- bezos-recipe-for-disruption.html. 3 Streitfeld, David, and Christine Haughney. “Expecting the Unexpected From Jeff Bezos.” The New York Times, The New York Times, 17 Aug. 2013, www.nytimes.com/2013/08/18/business/expecting-the-unexpected- from-jeff-bezos.html. 4 DeBord, Matthew. “Why Elon Musk Isn’t ‘Deeply Flawed’ in His Personality.” Business Insider. 11 December 2015, www.businessinsider.com/why-elon-musk-isnt-deeply-flawed-in-his-personality-2015-12. 5 Park, Andrew. “What You Don’t Know About Dell.” Bloomberg.com. November 03, 2003. https://www. bloomberg.com/news/articles/2003-11-02/what-you-dont-know-about-dell. 7 Rusli, Evelyn M. “A King of Connections Is Tech’s Go-To Guy.” The New York Times. November 05, 2011. http://www.nytimes.com/2011/11/06/business/reid-hoffman-of-linkedin-has-become-the-go-to-guy-of- tech.html. 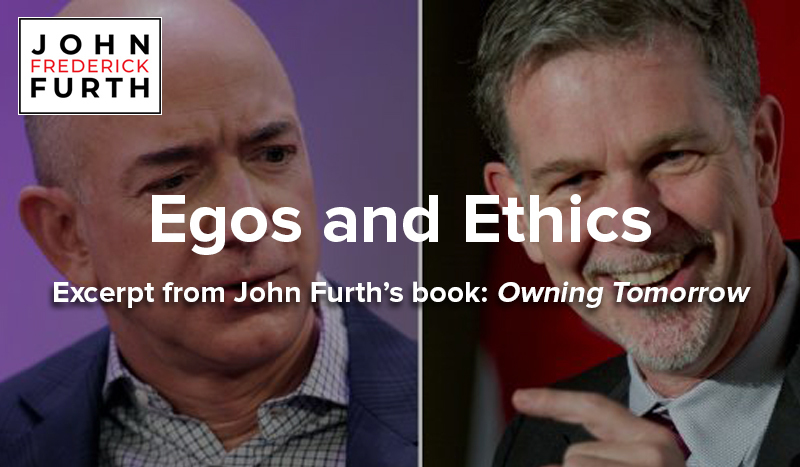 8Copeland, Michael V. “Reed Hastings: Leader of the Pack.” Fortune. November 18, 2010. http://fortune. com/2010/11/18/reed-hastings-leader-of-the-pack/.